Lefkas enjoys characteristic Mediterranean climate with mainly wet, hot summers and cool winters. Summer temperatures begin in May and continue through until October. The hottest months are July and August with average temperatures of 25?C. Apart from crystal clear blue sea and spectacular beaches, there are numerous other attractions in Lefkada including plentiful natural beauties, historic sites, museums and monasteries, and most important must see of the Lefkas island include: Nydri; the mediaeval Venetian castle of Agia Mavra; prehistorical city of Nirikos; Lefkata cape; Monastery of Faneromeni,the most important religious centre of Lefkada; the Archeological Museum; Agios Ioanis Antzoussis Church; Waterfalls of Dimosari and numerous other tourist attractions. Lefkada is named by the white rocks (Greek leukos=white) in the Lefkata cape, southern part of the island. According to mythology, the poetess Sappho threw herself to the sea at Cape Lefkada because of the love for Phaon. 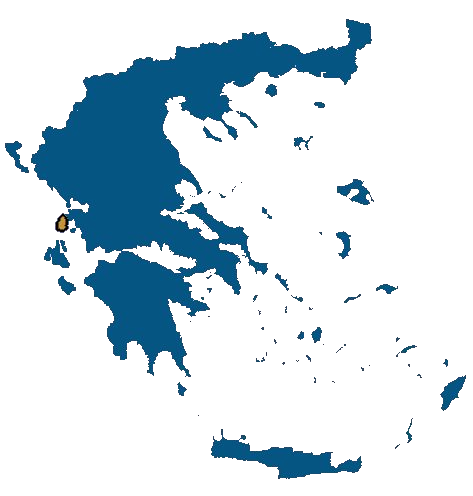 The German archeologist Wilhelm Dorpfeld suggested that Lefkada in fact was Homer’s Ithaca and that the palace of Odysseus was located west of Nidri on the south coast of the island. Levkas played an important role in many wars through history, like Persians Wars or Peloponnesian War. A huge earthquakes destroyed the major part of Lefkada first time in 1948 and after that in 1953, so a very few examples of the traditional architecture are still standing on the island. However, the Island’s architecture was influenced by numerous western civilizations, especially the Venetian, but also lots of traditional houses can be found across Lefkas. Especially interesting are the wooden houses covered with colored metal sheets. Byzantine architecture can be seen through many churches on the island. There are a plenty of beautiful sandy beaches on the island, but the most popular include Porto Katsiki, 45km southwest of Lefkada town, near Lefkata cape, accessible by the 347 steps sloping of the mountain and Egremni Beach, located about 30km from Lefkada’s capital, surrounded by imposing cliffs. The both beaches are well organized, with umbrellas, sun beds and beach bars. Other notable beaches on the island include Kathisma, Agios Ioannis, Nydri, Ammoglossa and Poros Beach. Visitors in Levkas shouldn’t miss discovering its lovely mountainous and seaside villages. The main village is Lefkada Town, the capital and administrative center of the island. It’s also the most vibrant town of the city. The other villages are typically tourist resorts that especially come alive during summer months. Some of the most popular Lefkada’s villages include Agios Nikitas, Vasiliki, Kalamitsi and Sivota village. Tourists can get to Lefkada by car, plane and ferry from nearby islands. The nearest airport to Levkas Island is the airport of Aktion, 25km from Levkas Town, in the mainland which can be reached with flights from Athens. This airport also serves numerous charter flights during summer and some domestic flights. To get from the airport to Lefkas, visitors can use cars, rent-a-cars or taxi. There aren’t ferries connecting the island with the mainland, but there are ferry lines between Lefkada, Kefalonia and Ithaca. Because of its bridge connection to the mainland, lots of tourists from Greece and Europe come to Lefkada by own cars. Accommodation solutions in Lefkada are plentiful and range from vacation apartments and budget studios to luxury hotels and private villas near the coast. Tourists can book hotel rooms in one of island’s numerous hotels or holiday apartments totally equipped with kitchens, own bathrooms and balconies or terraces, as well as with other modern conveniences needed for enjoyable stay during vacation. There is a great number of restaurants in Lefkada Town and other island’s villages like Poros, Nidri or Ligia where visitors can have tasty and fresh seafood specialties as well as numerous homemade traditional meals, salads and sweets. Whilst on Lefkada, visitors don’t miss enjoying in traditional Greek specialties. Similar to other greek islands, on Lefkas visitors can try authentic local dishes like savoro, aliada, bakaliaros, maridopita, bourdeto, frygadeli and miscellaneous pies. Almost every bar or cafe in the island offers happy hours with drinks discounted and entertainment like karaoke where people of all ages can enjoy lots of fun and large selection of drinks. There is also a wide array of taverns across the island with live traditional music and often “Greek Night” program offering visitors to discover a piece of rich Greek culture.